With summer heat comes the challenge of keeping our lawns and gardens looking vibrant and lush. Keeping your yard at its best is vitally important if you’re selling your home; quality curb appeal makes for an ideal first impression. 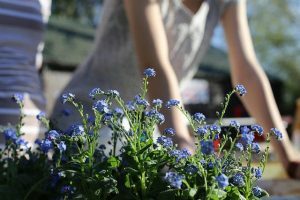 Check out the following tips for lawn and garden care to help retain a healthy and beautiful yard this summer. Be water wise. It’s tempting to water your garden to soaking every day when the temperature rises, but it’s best to not give in to this idea. You should water frequently during the summer. The ideal amount is 1 inch of water at any given time. Plants can only absorb so much water, once they’re saturated, any more is just wasteful and could damage your plants in the long run. Cool, morning hours are the best time to water. This keeps water evaporation lower, as plants have time to absorb the water before the heat takes it away. Watering early can also lessen the likelihood of fungus growth. When it comes to container plants, water them in the same manner, often, but no more than 1 inch at a time, and move them to the shade if the heat takes a toll on them. Keep the soil cool. Applying a fresh layer of mulch around your flowerbeds and garden will help keep soil cool and moist. For the summer months, stick with a dry mulch such as shredded bark or straw. Mulching can also help lessen weed growth. If you go for straw, pick a low-weed variety. Some types such as oat hay often have a lot of other seeds mixed in, allowing for more weed potential. Continue to weed. As much as we don’t like to weed, staying on top of this task in the summer is important. Remember, a weed is any plant growing where you don’t want it to. Weeds take away water and vital nutrients from the plants you’re cultivating. Keep them out to keep your garden from having to compete for its needs. Mow and prune with care. Mowing your lawn too short can actually cause it to yellow and brown. Allow grass to grow between mowing. The ideal length to cut is never more than 1/3 the height of your grass. During the heat of summer, leaves on shrubs will help keep shaded areas. Pruning plants encourages new growth; when it’s hot and dry, forego pruning as much as possible. This way, your established roses aren’t competing with new stems and shoots. Watch for pests during the summer months. Mites, aphids, and caterpillars can cause a lot of damage to plants. 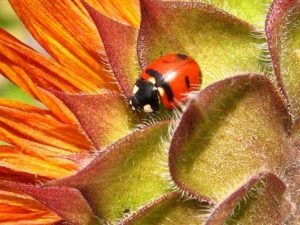 Natural deterrents such as ladybugs, which you can purchase at garden centers, can help keep pest populations down. There’s also a variety of natural ingredients such as citrus oils and vinegar and garlic sprays which can do wonders in the garden without toxic chemicals. Summer lawn and garden care is about keeping your yard vital in the heat. For more summer tips, check out this article published by Today’s Homeowner. When you’re ready to sell, you want the process to go smoothly. The Jim Powers Team of local experienced Realtors® is here to help you. Visit our website to learn more, then contact us or give us a call at 717- 417- 4111.